Doctor Who: Welcome the Future – Geek Girls Rule!!! 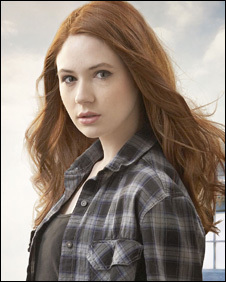 Little known 21-year-old Scottish actress/model Karen Gillan has been cast as the Eleventh Doctor’s companion for the 2010 season of Doctor Who. She previously had a small role as a soothsayer in the 2008 episode “The Fires of Pompeii”. New showrunner Steven Moffat stated that numerous actresses were auditioned, but as soon as she “walked through the door the game was up”. The 2010 season of Doctor Who will have more changes than I can ever remember for a new season: a new Doctor (Matt Smith), a new companion (Gillan), a new showrunner (Moffat), new executive producers (Piers Wenger and Beth Willis), new producers (Tracie Simpson and Peter Bennett), and even a new TARDIS interior. I suspect the show will at first feel as different as it did when it was first revived in 2005 after sixteen years off the air. Also, here’s the trailer for Torchwood: Children of Earth, the five-part miniseries set to air in July.